Are you having issues with the hot water in your home? Call All-n-One Plumbing at (816) 886-7600 today for fast, affordable water heater service solutions you can count on. Save on our wide range of services by visiting our coupons page. Your water heater is one of the most critical elements of your home’s plumbing system because it is responsible for providing you with access to hot water when you need it the most. 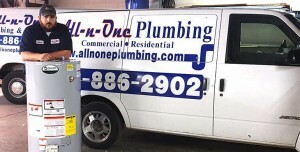 At All-n-One Plumbing, our qualified specialists are happy to visit your home and help you maintain the lifetime of your unit with repairs and maintenance, as well as help you enjoy access to hot water when you need it the most. Do You Need Water Heater Repairs or Installation? If you’ve been experiencing issues such as cold shots of water during what you expect to be hot showers, intermittent access to hot water, or even worse, no hot water at all, then it’s time to give us a call for professional repairs. While we are experts in water heater installation if it’s determined you need a new water heater at All-n-One Plumbing our plumbing experts will help you explore repair options first. Like any major appliance, as water heaters age they will begin to break down and start to show signs of wear and tear. It’s important to contact us the moment you start experiencing symptoms of malfunctioning systems. If left untreated your water heater may begin leaking onto your floor. This can cause water damage and encourage the growth of mold and mildew. Give us a call for a professional solution. Our team of plumbing experts is committed to providing exceptional customer service with every job, which means that when you need timely water heater installation and repair services, your best bet is to call All-n-One Plumbing. We are a team of friendly professionals: Our specialists are approachable and are fully committed to providing you with an excellent customer experience. Quick, high-quality solutions you can count on: We know your time is important to you, which is why we will never keep you waiting and will work until the problem is completely resolved. We are a local, family-run company: You can expect personal attention from our family-run team. We treat every customer to the quality service they deserve. Peace of mind: All our work is backed by a warranty. If something goes wrong during that period, we are happy to return and fix the issue. We will do our best to deliver the results you are looking for without any hassle on your part. Never worry about choosing between quality service and affordable prices when you work with us. Call (816) 886-7600 and learn more about our cost-effective water heater solutions in Independence, MO and the greater Kansas City area.